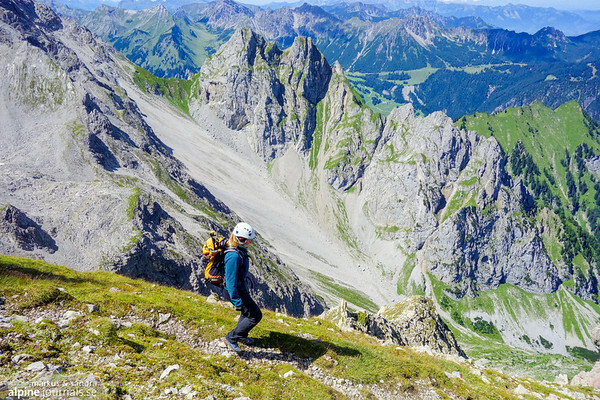 Starting from Bürs and Sarotlahütte in Rätikon, via Zimbajoch and Zimba Westgrat (west ridge) to Zimba summit (2645m). 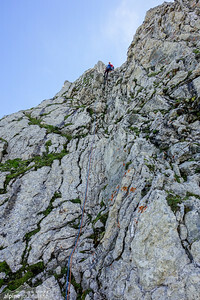 Descent via NO-grat (north east ridge) in 2-3 abseil pitches. 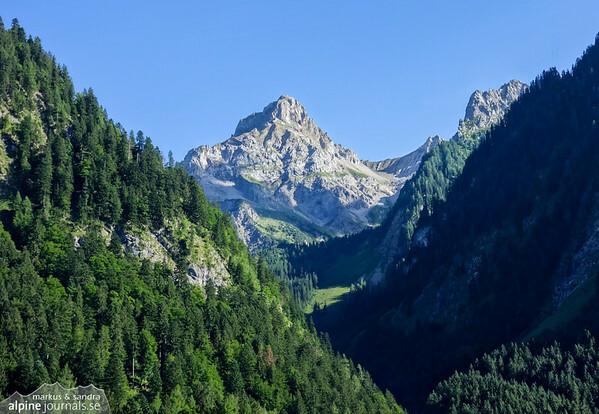 Zimba is a landmark in the area of Montafon, Vorarlberg. 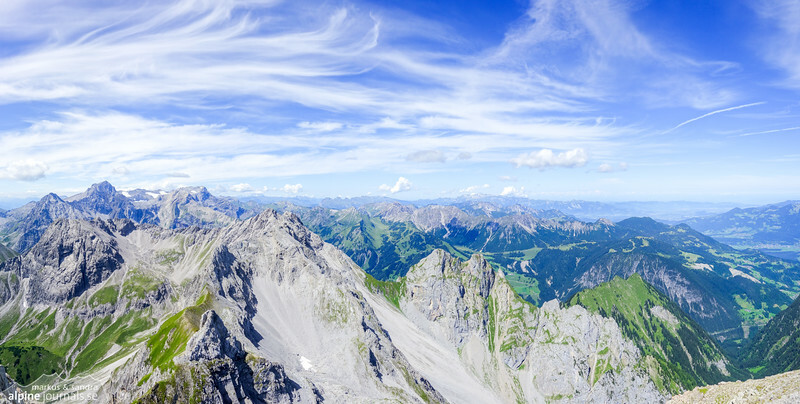 Its steep summit slopes will only allow climbers to the top; the mountain is affectionately called the "Matterhorn of Montafon". 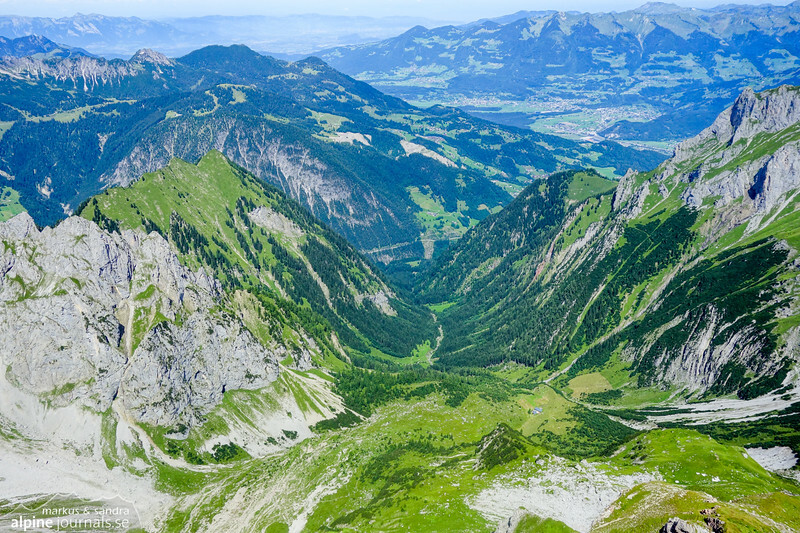 Well, the resemblance may not be perfect, but it is definitely a worthwhile easy-grade alpine climb in beautiful surroundings. Together with our friend Laura we opted spontaneously for a Sunday-Monday trip. We'd lost some good-weather windows already due to injury or illness, and with this summer's chronically unstable weather, one ought to use the remaining days of stable sunshine that do appear. 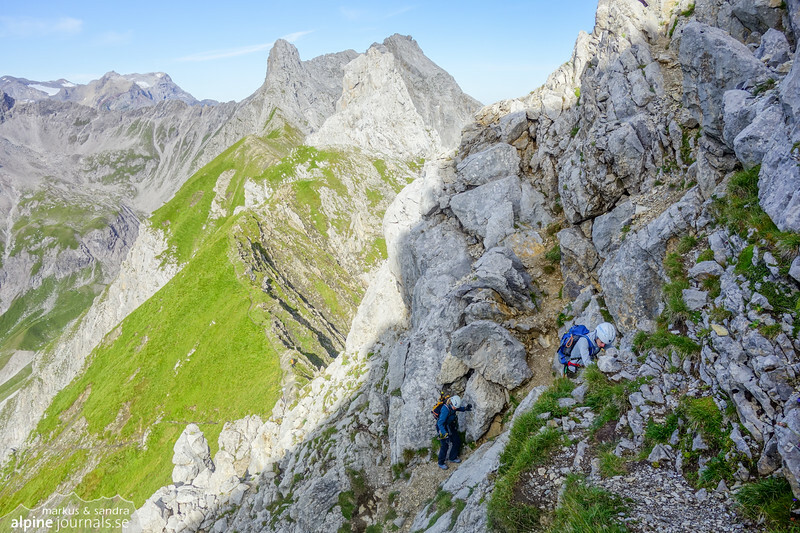 So, on Saturday evening we packed for one night at the Sarotla hut, as well as a visit to the steep sport crags by Bürs since we were passing through anyway. Sunday afternoon, with finger skin well torn away, we began the beautiful ascent through the Sarotla valley. 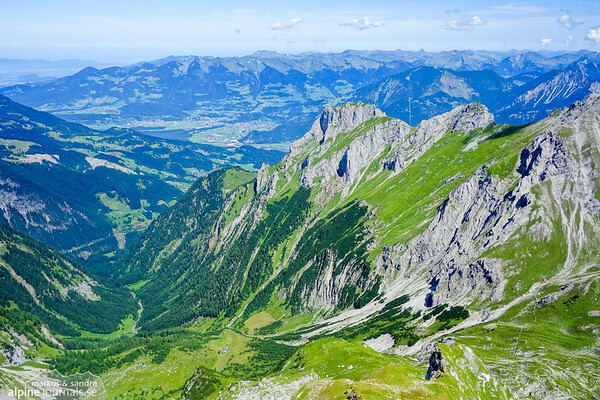 Bordered to the east and west with steep, largely forested mountains, the valley reaches south in a narrow U-shape. The path is mostly shaded by forest and cooled off by the nearby river, both welcome treats in the afternoon heat this day. The clear morning sky bears promise of a brilliant day. From the Sarotla hut, a narrow path winds up ever steeper to Zimbajoch. The last section to the saddle on steep soft mud-rock. Careful steps, then we are up, hurrying to get out of the cold wind on the ridge. We've made good time so far - but where to go from here? 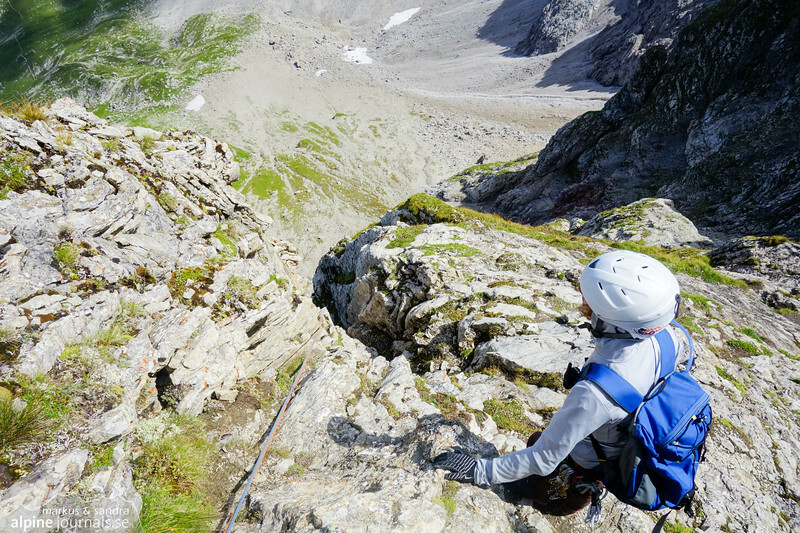 After the first few meters there is no path to the start of Zimba Westgrat, only scrambling wherever seems the easiest and most worn. The ground is pretty loose so please put that rock back where you found it, thank you. 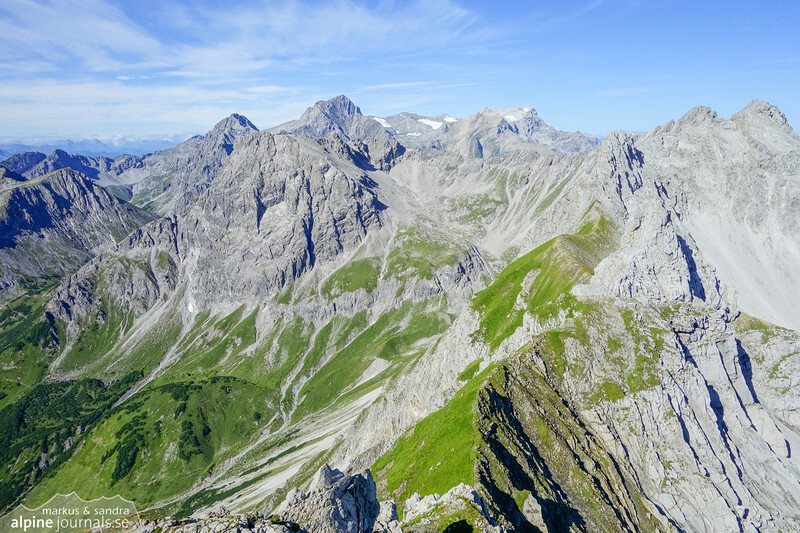 After perhaps 250-300 m of this, we can see the beginning of Sohmplatte (III+) just above. 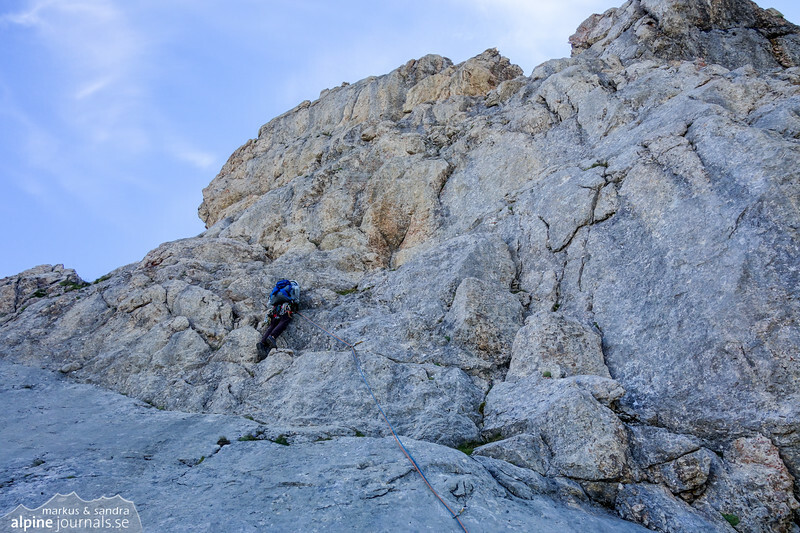 Only a traverse out the right, a little hairy but short and easy, and we wind up at the first belay. Finally ready to climb! Our trio is really eager to get started now, once more exposed to the chilly morning winds and the fingers struggling to get things done even with gloves on. Always interesting how things can turn swiftly from one minute to the next in the mountains. The start on Sohmplatte is polished, but the holds are good and protection sufficient. Nice and solid climbing. The second pitch is interesting too, with its diagonal crack to crawl through. Again it's polished, but the greater struggle is with the backpacks that want out, claiming they didn't volunteer for this. 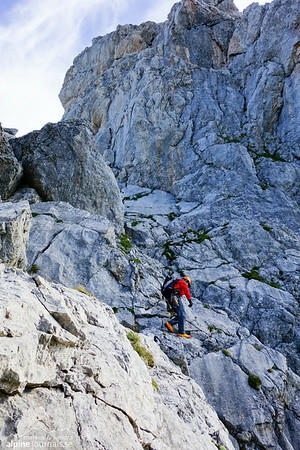 After the second pitch there's about 100 meter of scrambling along a horizontal ridge. Scenic but simple. 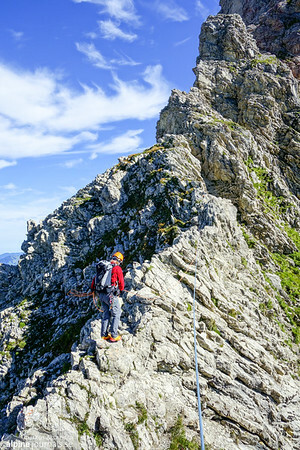 At the end of the ridge, a long sling around the big rock for a belay stand will do just fine for belaying the next pitch. 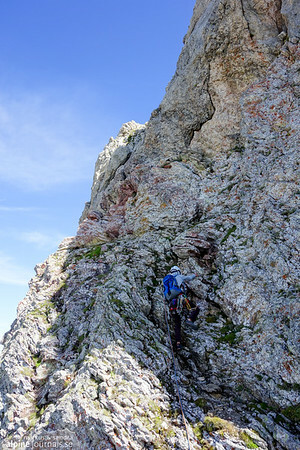 The next pitch is a section of steep rock that leads up on the right hand side of a smaller tower before Rote Turm. 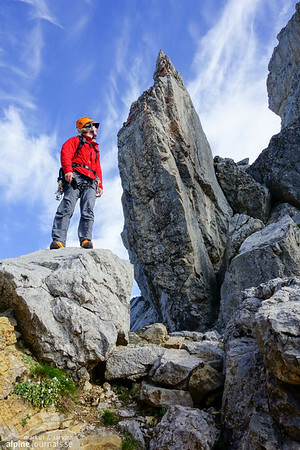 The first tower probably has the largest portion of unstable rock on the route. At least if you keep to the right along the natural looking line, as we did. Maybe going directly up the steep edge to the left is intended, but we cannot see any protection nor know if that's really a good choice. So after some discussion, we stick to what we can see from our belay and Laura pushes on, taking the lead through the loose terrain. The climb continues around the tower and up on "Rote Turm". 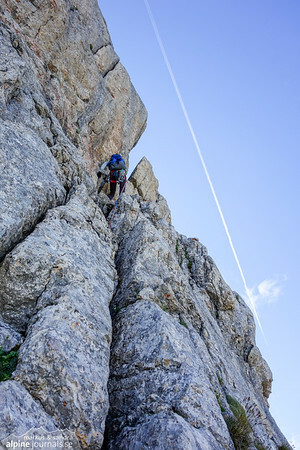 It's a long pitch, so soon our troubles evolve from loose rock to that of rope drag. Just one single tuft of grass, creating so much trouble… Of course, Laura eventually has to climb back down to lift the rope over the tuft to free herself. By now, two guided parties have caught up with us at once. Oh well, let them pass as guides normally do. One party to the left, another to the right… We're not really slow while actually climbing, but the way finding isn't too easy, and we're honestly glad that they can now show us the way. It comes in handy right away. Next up is a traverse to the left, but it doesn't nearly traverse as much as the topo would have us believe. Rather, it shoots straight up half-way in and then continues straight up to belay. Not much later we are hiking the last distance to the summit. Up at the cross we pause to greet one another and the other parties, write something jolly in the summit book and enjoy the moment as one ought to. The weather is as splendid, as the panorama. Laura, who knows the area well, points out summits, and we forget the names right away (sorry!). What an extraordinarily pleasant day in the mountains! No stress, no drama, just the usual elements of a good day out. Still, time to move on now, keen to save some time for a pit stop at the hut later on. The quickest way down from Zimba is along the north-east ridge, with three abseils starting some distance down from the summit. A faint path and a little cairn shows the way. With the girls of our group abseiling the first two pitches of 45 meters in one go, Markus who goes last has to stop mid-way once we realize that the ropes won't give, sticking hopelessly to a crack somewhere along the way. 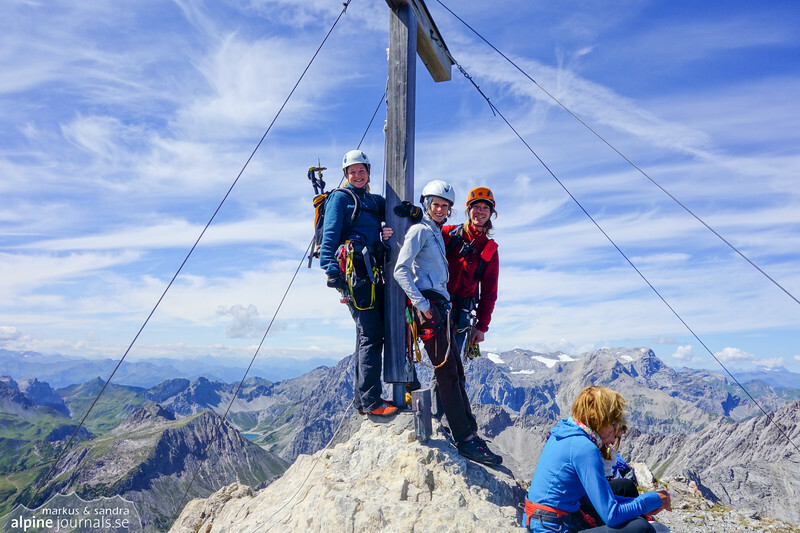 So, even if the 50 meter ropes will reach, we recommend to split the abseil in two just to be on the safe side. 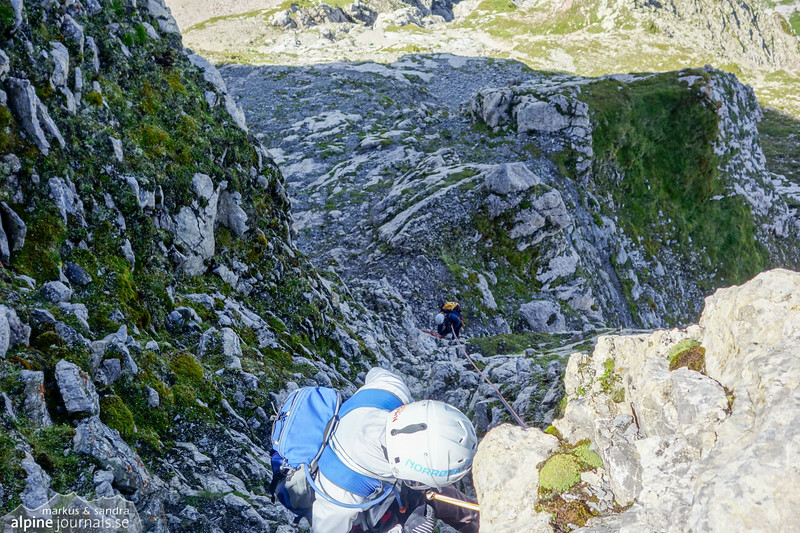 The first/second abseil ends on a tiny plateau with two potential ways down. The proper one turns out to go a little left, down-climbing in the steep runnel for a few meters. The next anchor is hidden from our view on a protruding rock. Then, after this last abseil, it's only steep hiking all the way down to the foot of the mountain. The path back to Sarotla is easy to hike, but we find ourselves a little confused when, out on a grassy hill, the path ends abruptly and a steep drop lies between us and Sarotla valley. Well, it turns out that the path has bent to the left, and we only have to backtrack a little to see that we missed the proper turn. Phew! Just happy that things work out this well today. Soon we are back at the hut safe and sound, celebrating with a wonderful Apfelstrudel with vanilla sauce. The Sarotla hut can really be recommended any day. Nice, helpful people, great views to the magnificent landscape and certainly equipped with the best heating room in the entire Alps (it's heated with a wooden stove, even in summer!). Many thanks to Laura for another great tour, and also to Zimba, of course, for your hospitality. We started at 07:10 from Sarotlahütte. 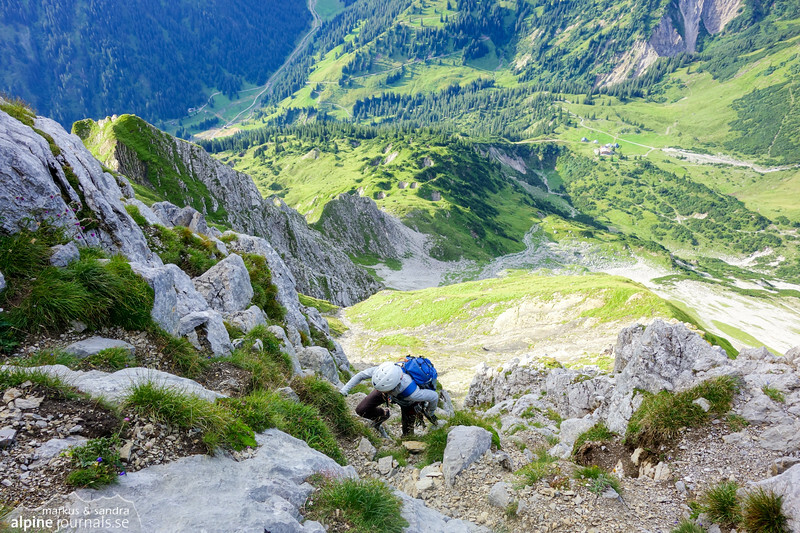 The path to Zimbajoch is steep but unproblematic. 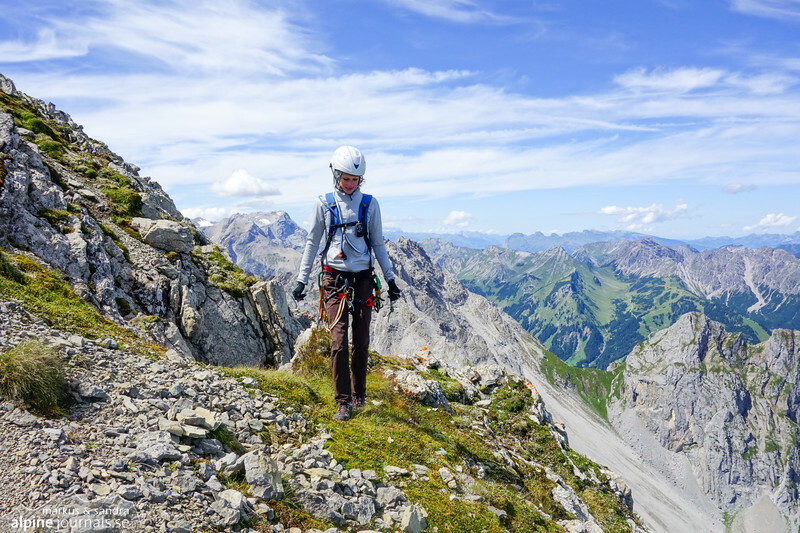 Scrambling up Zimba Westgrat from Zimbajoch requires some nerves. There is no marked path, you just go where it looks least difficult. Second pitch goes through a huge, polished crack. End of second pitch at Zimba Westgrat. From here its an easy ridge walk for 100 meters. 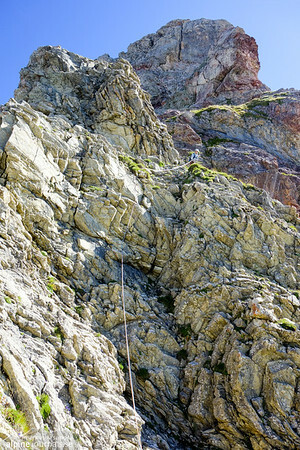 Getting some rope drag on the third pitch. Wayfinding wasn't easy. 'Rote Turm' is next up to the right. 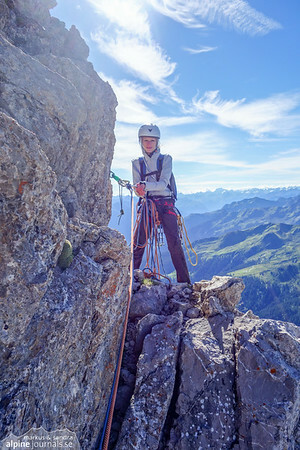 Last pitch from Rote Turm. 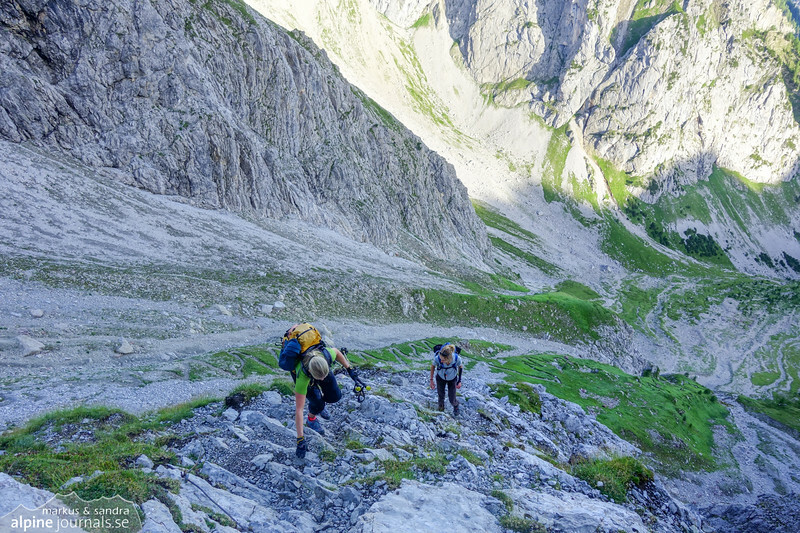 Here you have to be careful to turn up (right) after 15-20 meters where the rock looks worn, and not continue in a straight line as the topo suggests. Getting down from Zimba is probably fastest here at the north east ridge (NO-grat) which you can abseil in three short pitches. We went straight down from this point, pausing after 15-20 meters at some slings to reduce the rope drag. The 50 meter ropes did reach the bottom, but were constantly falling back into a rock crevice making the extra stop necessary. Third and last pitch down is well hidden behind this rock.